What Are the Medical Effects of Exposure to Smoke Particles? Particulate pollution is the most important contaminant in our air. ...we know that when particle levels go up, people die. "Air pollutants can also cause immune suppression or overstimulate the immune response, which can lead to allergies and immune-mediated diseases. Air pollutants have also been linked to psychological disorders and toxic damage to the nervous system and the brain, especially in developing fetuses or young children. In addition, the report points out that air pollutants are thought to have detrimental effects on the reproductive and endocrine systems, but according to the conference summary, these effects require more research to be fully understood. The report points out that certain populations, including children, the elderly, and minorities, are at a higher risk of being affected by air pollutants (American Medical Association, 1995)." Air Pollution Found To Pose Greater Danger To Health Than Earlier Thought Date: 9/21/05, LOS ANGELES (Sept. 20)-Experts may be significantly underestimating air pollution's role in causing early death, according to a team of American and Canadian researchers, who studied two decades' worth of data on residents of the Los Angeles metro area. Smoke equals ultra fine particulates. Much of the following research pertains to all fine particulates (also known as PM2.5). PM2.5 is primarily created by combustion. Meet Your Body : An introduction to how wood smoke hurts your health. Mechanisms of Disease and the Healthy Cardiovascular System. 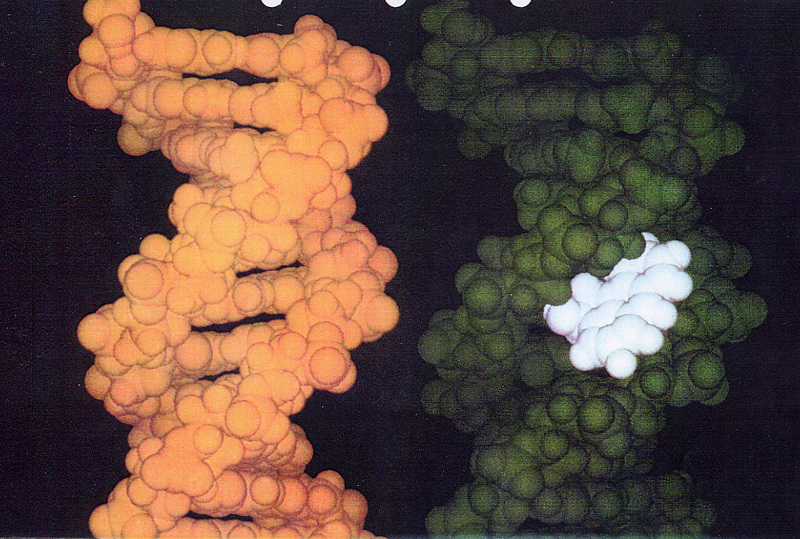 EPA picture simulating how Polycyclic Aromatic Hydrocarbons, (PAH) adhere to DNA ( see the white patch). Wood smoke particle taken from a human lung enlarged. Original picture size 3 7/8 " by 3 3/8" at 900x enlargement. Chest p.1232. Interstitial Lung Disease and Domestic Wood Burning, Ramage, Roggli, Bell and Piantadosi. Mice exposed to wood smoke demonstrated more dramatic pathology than mice exposed to cotton or polyurethane smoke. A CD-1 model of wood smoke exposure was developed, demonstrating type II cell hypertrophy, cytoplasmic blebbing, cytoplasmicvacuolization, sloughing, hemorrhage, edema, macrophage infiltration, and lymphocyte infiltration. The bronchoalveolar lavage fluid of smoke-exposed mice demonstrated a significant increase in total cell counts compared with those in control mice. These findings are comparable to the lung tissue response observed in human victims of smoke inhalation. Update 2004 from the American Lung Association: 20 million Americans have asthma or 1 in every 14 people. In some Northern California counties it is 1 in every 10 people. Respiratory Tract Inflammation and Mucous Cell Hyperplasia from Repeated Exposure to Wood Smoke (study outline). It is important to consider wood smoke exposure as a possible risk factor for the development of lung cancer in nonsmoker subjects." 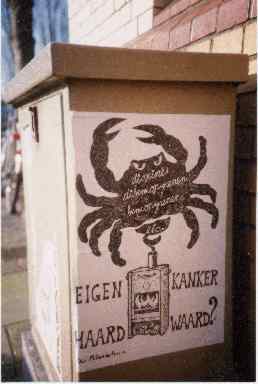 Toxins from wood smoke inhalation sit in the bladder and can cause cancer of the bladder. Measurement of Urinary Methoxyphenols and Their Use for Biological Monitoring of Wood Smoke Exposure. Wood Smoke exposure is a risk factor for Meningococcal Meningitis. "Exposure to smoke from cooking fires or close contact with a case puts people at risk of contracting meningococcal meningitis. " 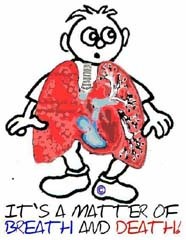 COPD: Thanks to COPD Resource Network for their artwork. Wood Stove Pollution Can Cause Chronic Obstructive Pulmonary Disease (COPD) Public Health News : Article Date: 20 Feb 2006 - 2:00am (UK) (Off Site) " "Biomass (wood) smoke is composed of a relatively equal mixture of coarse and ultrafine particles and can penetrate deeply into the lung, producing a variety of morphologic and biochemical changes," said Dr. Ramírez-Venegas." Heart attacks are linked to smoke particles. UK: Report On Cardiovascular Disease And Air Pollution "-- That the inhalation of particles found in the air causes chemical reactions in the body to take place which increase the likelihood of blood to clot and/or atheromatous plaque to rupture, leading to heart attack.-- That particles subtly affect the control of the heart's rhythm. " High Blood Pressure linked to fine particulate exposure. Effects on Host Pulmonary Immune Defense, Judith T. Zelikoff, Ph.D. In a laboratory study at NewYork University, animals exposed to wood smoke immediately had a 25% decrease in the lungs' ability to clear bacteria, and after just 1.5 to 2.5 hours, had decreases of 23% to 61% in lung function. Wood smoke may be a risk factor for Sarcoidosis. Rise In Pneumonia Hospitalization Rates For Older Adults, USA Asthma/Respiratory News Article Date: 07 Dec 2005 - "There has been a 20% increase since 1988 - this coincides with the EPA Clean Wood Stove Campaign." Ed. Diffuse Infiltrative Lung Disease Including Selected Pneumoconioses (PDF) (size 39 KB) and seeDiffuse infiltrative lung disease for great slides and pictures by Ed Uthman, MD (uthman@neosoft.com), Diplomate, American Board of Pathology. Responses to Smoke Inhalation New reports on how cells are injured by smoke inhalation. Smoke from the burning of the straw residues from Kentucky grass seed fields contains at least two different types of organic compounds, i.e. the phenolic compounds and the PAHs. The phenols appear to be present in much higher concentrations than the PAHs. In the short-term, inhalation of this smoke, from MSDS toxicity data, would appear that these relatively volatile phenolic compounds are likely to cause acute irritation of the mucous membranes of the lungs as well as eye and skin irritation. Further, the long-term carcinogenic effects due to exposure to the PAHs could be expected. Children Short Term and Long Term Health Effects From Wood Smoke. Bio Fuels Linked With Lower Birth Weight. Mental Retardation from Polycyclic Aromatic Hydrocarbon exposure in the womb. Off our site, click to go to "An Annotated Bibliography on Acute Respiratory Infections and Indoor Air Pollution with Emphasis on Children Under 5 in Developing Countries,"
Burn Injury caused by open burning. Pub Med 230 MEDICAL ABSTRACTS:1/12/02, the wood smoke list. Also do a fresh search on pubmed. Off our site, click to go to Australia: Summary of published literature showing adverse health effects of woodsmoke in table format. University of New England Air Quality Research Group. This research was published as a refereed paper in Clean Air, v.32, no.3, August 1998. Dioxin: Burning 1 kilogram of wood produced as much as 160 micrograms of total dioxins. Lead: produced from burning 2.2 pounds of wood = 0.1mg to 3 mg.
Formaldehyde Thad Godish, Ph.D, Department of Natural Resources, Ball State University. Carcinogens Polycyclic Aromatic Hydrocarbons (PAH): Residential wood burning is the source of 50% of airborne Polynuclear Organic Material (POM) in the U.S. POM contain a group of compounds (PAH) which include many Class A carcinogens, the most carcinogenic materials known to exist. Air pollution measurements in a residential neighborhood on Christmas Day (the most wood smoke polluted day) showed early morning background levels of PAH of 20 ng/m3. The level increased as wood burning began, peaking at over 2000 ng/m3. The U.S. EPA estimates that the cancer risk from wood smoke is twelve times greater than from equal amounts of tobacco smoke. 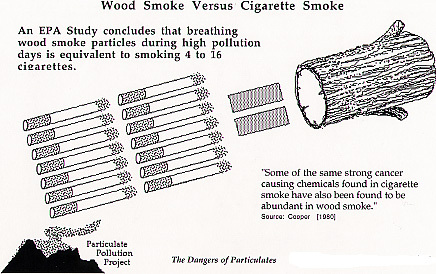 Wood burning also creates dioxins and cyanide. Swedish Report finds antioxidants in birch wood smoke. 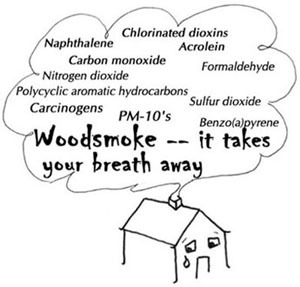 This is one of the only studies that has found a beneficial effect in wood smoke. We seriously doubt that it is a net gain. Science offers hope for new medical therapies.